Last Saturday I hit the road, to run some epic mileage – okay epic for me. With each long run that is passed my 13.1 mile marker, I find myself a little stressed and a little anxious, lately though the anxiety has eased off, and I have had more of a feeling of calm determination. I’m still way ahead of my training, and after this run, I am REALLY way ahead. At this point I should be starting to taper back in preparation for a marathon in three weeks. Instead I have 9 more weeks until I need to think of tapering – NINE WEEKS. I’m more than okay with this. 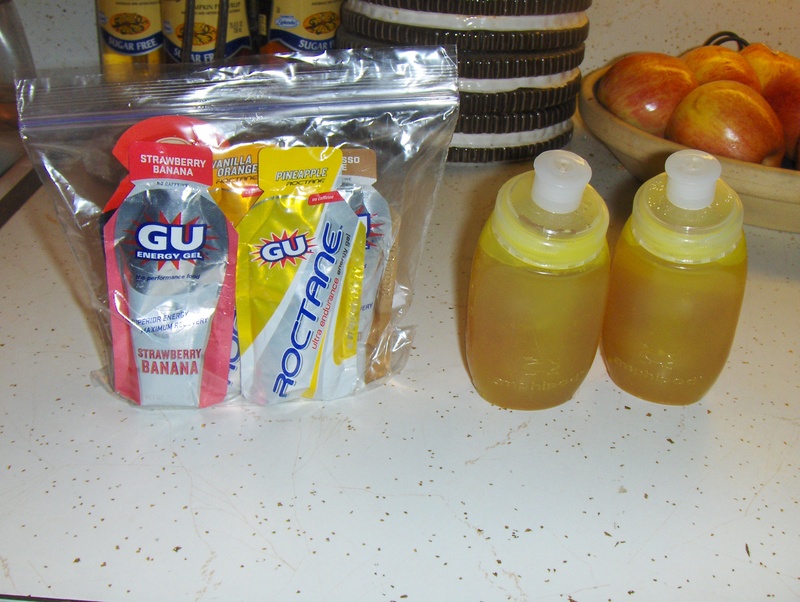 I actually got my pre-run prep work done (loading of gel bottles, and hydration pack) two nights before the run. I got smart this time, and to avoid the stumbles I encountered on my 18-miler with my missing gels, and added an emergency pack of gels to carry in my hydration back pack. 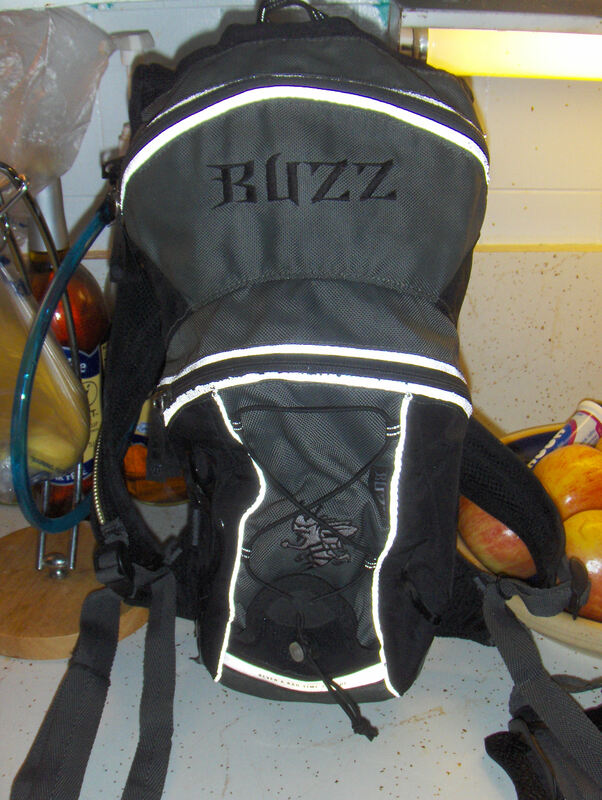 Here is a photo of my now dubbed beloved hydration backpack. I bought this years ago, at REI. Unfortunately they do not make this model anymore, but no matter, the Platypus bladders fit this model just fine! It fits me perfectly, and has double front straps, that keep it secure as I run. No sloshing for this gal! I finally was able to get out the door to run, before the sun came up. I think setting my alarm for 4:15 helped that! By 5:30 AM I was headed out. I love running before the sun comes up; it makes me feel like I am invisible – a shadow in the night. I know people prefer to run with headlamps, blinky lights, and reflection vests when they run in the dark, but I prefer to not be seen. I stay watchful of my surroundings, and know when vehicle traffic is around me. I run like I am invisible, so as to be extra cautious of cars, trucks, and buses. We were lucky to have a break from the unholy high temperatures that we had been suffering through the entire summer. Finally a day that would not be close to 100 degrees! It was such a treat to be running in the coolness of the morning, instead of that steamy soupy crap that even at 5am, you could not escape. I even ended up wearing compression sleeves for the first 10 miles! I ran my way through Oak Cliff, around Lake Cliff Park, and to my trusty 7-11. The lady who works there is always asking about my running, and how far I am running that day. She gives me some good encouragement, along with use of the bathroom there, and a cooler full of Gatorade that I can pick from – I do pay for those by the way! 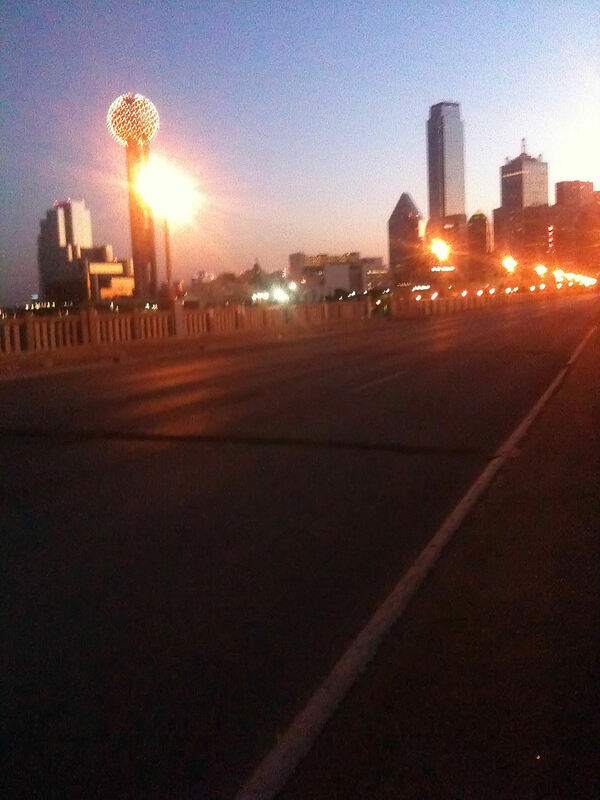 I headed up the Houston Street Bridge and the view was so pretty of downtown Dallas! The sun was just starting to come up, and the lights on the buildings were still glowing. The bridge was lit up as well. There was hardly any car traffic going across the bridge so I was able to get a pretty good shot of what I was seeing. Had I thought about it before I left the house, i would have placed my compact camera in my front pouch, instead of the back pocket of my backpack. It would have taken a much better photo. I ran into downtown and headed for my second pit stop; a McDonalds bathroom. I won’t eat there, but in a pinch their bathrooms come in handy. This time it was not clean at all, and there was no sign of any toilet paper. GROSS! They finally turned this sparkly new place into a crap hole. I got out of there as fast as I could. I knew there was a 5K event that was going on later in the morning, so I decided to use a port-a-potty there; anything but this place! The American Heart Association was having their annual Heart Walk by the American Airlines Center. It was still a couple of hours away from getting started, so I knew the port-a-potties would still be un-used and un-funked. I detoured to where they had their pre/post party set up, and they already had music going, booths up handing out goodies, and one ginormous inflatable slide that looked like a pirate ship being pulled under by a giant octopus. It was so cool! Had I had the time, I totally would have climbed up on that thing and slid down the sinking ship! I still had many miles to go, so I continued on my run up the Katy Trail. Hmm I wondered if I would see my long lost little friend – the gel bottle while running here. No luck. The trail spills out into Highland Park, just a mile away from SMU. My run had to take me right to the edge of the college, and to my halfway point – the Mockingbird Ln Starbucks. This is where I swapped gel bottles, removed my compression sleeves, replenished my hydration pack with more Gatorade, had a bathroom break, and turned around to run back home. At this point I was starting to feel some kind of twinge right above the inner side and back of my right knee. Instead of freaking out, I changed gears and started using the Jeff Galloway walk/run method for the remainder of my run. I have a neat interval timer that I carry called a Gymboss. I set it for 2:30 run and 1 min walk. This repeated and buzzed at me each time I needed to walk or run. My old Gymboss bit the dust during my 18 -miler, so I had to order a new one. It is a must have in my opinion! As I ran, I came to realize that Christie’s niece was doing her first 5K ON the Katy Trail. It was to benefit Cancer Research. I made sure to keep an eye out for her, and at that point was running most of the way down the trail. We spotted each other at the 1 mile mark for her 5K, and I gave her hell for walking. She did run some more, but as anyone can tell you, your first 5K can be harder than you expect, especially if you do not have the time to train for it. He then said something that was very sweet and encouraging. “Wow! That’s amazing! I am proud of you! You are going a great job!”Amazing what words of encouragement do to a person. It was that extra boost of positive that I needed to keep on my path. I thanked him, and continued on. I popped back by the Heart Walk to see how the festivities were going. I love event atmospheres; everyone gets into it and has a great time. As I passed the DJ stand, there were people dancing around him and having a blast! I especially got a kick out of the kid in the green shorts that jumped in at the end. As I continued on my run, I could see the participants of the Heart Walk coming towards the finish line. There were people who were sprinting, jogging, walking, and some who even looked as if “Why in the hell did I agree to do this?”. As I passed them I clapped my hands and told them that they were doing great. I made it out of downtown in good time, and even spotted some people canoeing in the Trinity River. Note this is not the first river I would choose to paddle in, at least the part that is going near downtown. It’s pretty nasty smelling at times. I stopped back by my 7-11, and checked in with my fan there. I grabbed another Gatorade and filled my hydration pack up. By the way who tightens these bottle caps?? Good grief I had to fight and slam that thing on the concrete to get it to open! I also opted to grab a N O Xplode shot, to give me just that last burst of energy. I usually don’t use these on my runs, but since I was on path to all-time distance, I figured it couldn’t hurt. A mile and a half later I had to duck into a restaurant to use their bathroom. Yeah N O hyped up my bladder in the process of giving me energy. Whew! I posted on FB my status, and everyone’s comments were played into my headphones. I had but 1.5 miles to go! I was never so happy to see my street coming up in the horizon. I was almost home – yay! I turned up the block, and ran through a crowd of folks, going to some gigantic garage sale. No one seemed to see me, and I was glad to not run someone over. I stopped doing the walk/run and just decided to run the rest of the way. As I got closer to my house, I could see my neighbor in my yard, as well as Christie. I held my fist in the air and let out a “wooohooo!! !” as I ran up to the house. At the time I didn’t know exactly how far I ran, due to GPS failing out. As best I could decipher, I ran about 20 miles. As soon as I got to my computer, and went through my route I realized it was more like 21 miles. TWENTY ONE MILES! One mile away from the infamous wall! Everything went great for my run, no shoe issues, and no lost gel bottles! Success! To celebrate I got cleaned up, and we went out for Indian Food. To be honest I didn’t eat as much as I thought I would! 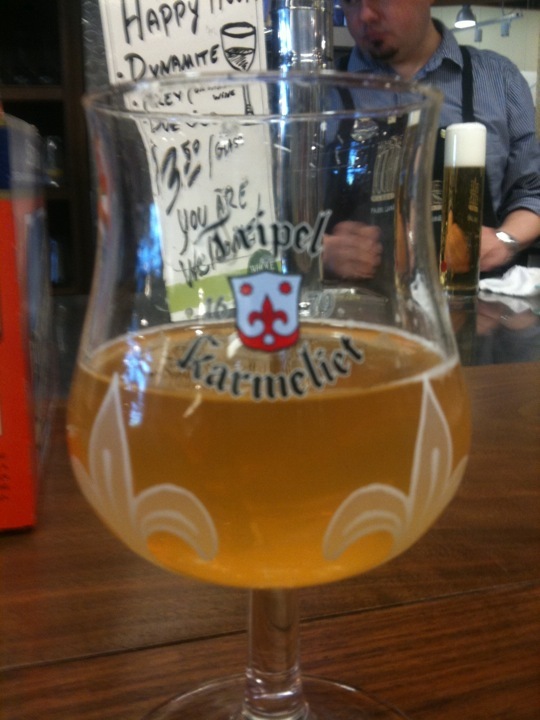 Then we ended up at the Whole Foods wine bar, and toasted success… Belgium style! This entry was posted in Gear, running events, Running the Rock by Raven. Bookmark the permalink. I loved this post….it was cool to hear how your run really was like an adventure!